The paleoecological history of the Americas is as complex as the region is broad: stretching from the Arctic Circle to Tierra del Fuego, the New World features some of the most extraordinary vegetation on the planet. But until now it has lacked a complete natural history. Alan Graham remedies that with "A Natural History of the New World". With plants as his scientific muse, Graham traces the evolution of ecosystems, beginning in the Late Cretaceous period (about 100 million years ago) and ending in the present, charting their responses to changes in geology and climate. 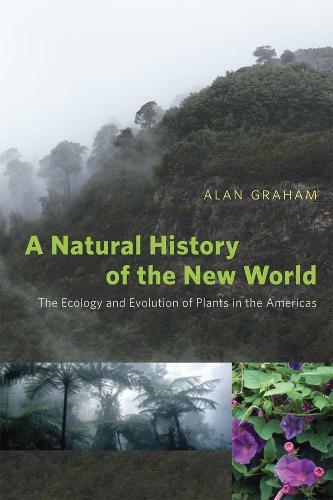 By highlighting plant communities' roles in the environmental history of the Americas, Graham offers an overdue balance to natural histories that focus exclusively on animals. Plants are important in evolution's splendid drama. Not only are they conspicuous and conveniently stationary components of the Earth's ecosystems, but their extensive fossil record allows for a thorough reconstruction of the planet's paleoenvironments. What's more, plants provide oxygen, function as food and fuel, and provide habitat and shelter; in short, theirs is a history that can speak to many other areas of evolution. "A Natural History of the New World" is an ambitious and unprecedented synthesis written by one of the world's leading scholars of botany and geology. "For all those who've wanted to travel in a time machine to witness New World plant life and ecosystems since the Cretaceous period, here is your chance. This is an unprecedented and much-needed account of American natural history that will serve as the leading book of its kind for many years." "This book is unique in describing the biotic history of the New World from the viewpoint of plants. It documents, from Alaska to Tierra del Fuego, the incredible changes in vegetation that have occurred over the past 100 million years. Studying this turbulent biotic history is vital if we are to understand how human intervention will affect the Earth's system; this book should be essential reading for any who wish to understand how geologic and atmospheric changes induce radical changes in ecosystems." "A fascinating, comprehensive, and very readable account of past and present lands and life in the New World. Alan Graham has given us a book full of tales of the wonder, grandeur, and heroism of the New World. It is full of information about geology, biology, and the history of the people who explored and discovered aspects of the ecology and the evolution of New World vegetation. It includes a broad range of topics, resulting in a comprehensive account of the natural history of plants in the Americas and the people who studied them. Graham's half century of experience, his knowledge, and his engaging presentation of New World natural history will benefit the politician and the poet as well as the biologist, conservationist, and well-informed traveler."